Welcome to my space. This web site concern my work as a professional portraitist. 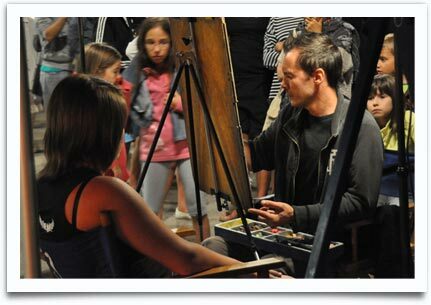 You'll find a portrait gallery with many samples made with pastels, oil paintings and more, my rates, and all the steps to be followed to get your portrait done. My portraits web galleries are here to help you through your choice.. For every picture in the galleries, a popup message will appear to the flyover of the mouse, pointing out to you the used technology, the size, and the corresponding price. The second step is to send me an email presenting the project. Try to specify the kind of portrait you want (technical, size, support. Is it color, black and white ...), your time and do not forget to join the pictures. If the pictures doesn't match with my required specifications, I'll send you the instructions to get some better one done, by mail. Once the project is accepted, you have to send the selected pictures by mail, and get a bank transfert done for the 30% deposit. When the portrait is done, I'll show you the result by sending you a picture of it by email. Then you got to transfert the rest of the amount. After that, the portrait is shipped to your address by post mail. I'll be finally waiting for an email from you, confirming that the portrait arrived in time, safe and sound.